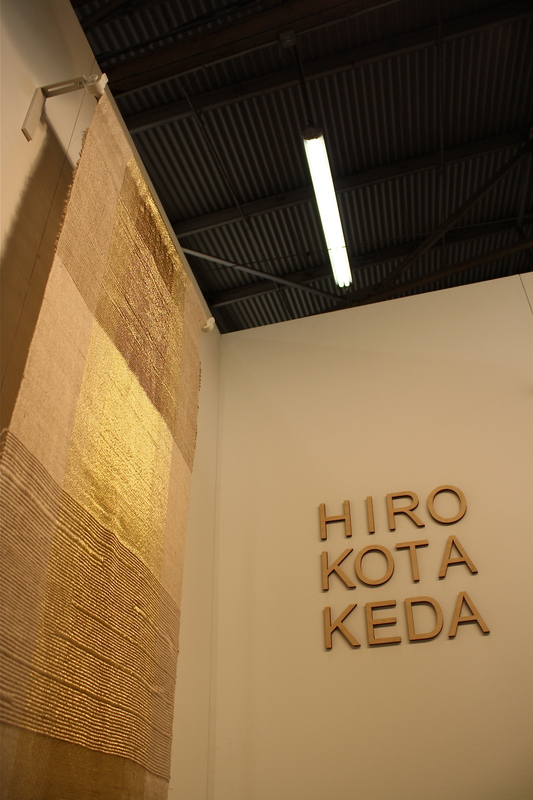 Hiroko Takeda ~ Of all the incredible art I experienced, this hand woven gilded textile by Hiroko Takeda was my favorite discovery. 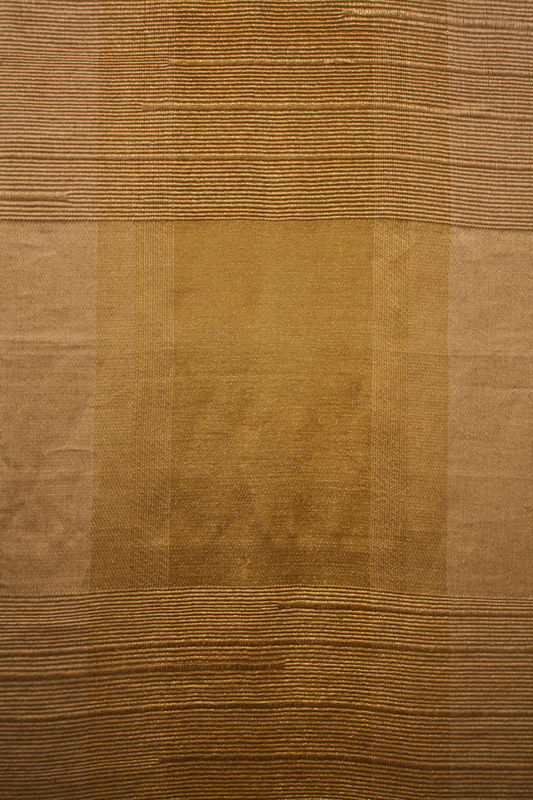 Her sublime play of texture and pattern is unlike anything I’ve ever experienced before. 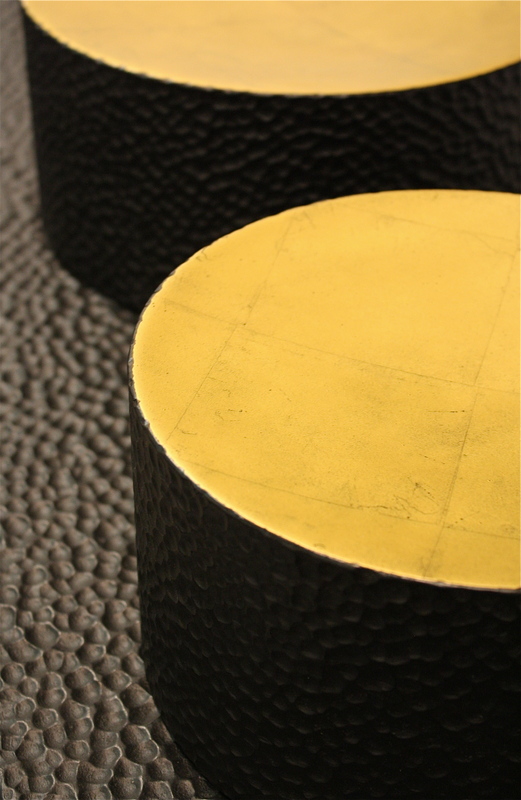 Using traditional and experimental techniques, she respectfully illuminates the beauty of her materials while pushing the boundaries of creation. Timeless and modern, her work will surely stand the test of time. Joel Urruty ~ Of all the wonderful people I encountered at the show, Joel was perhaps the most fun-loving and joyful of them all, and with a laugh so contagious, I wish I could have bottled it up and taken it home with me! With every meeting, we had more to share and more to laugh about. One of my favorite moments included the back story behind his newest wall creations. 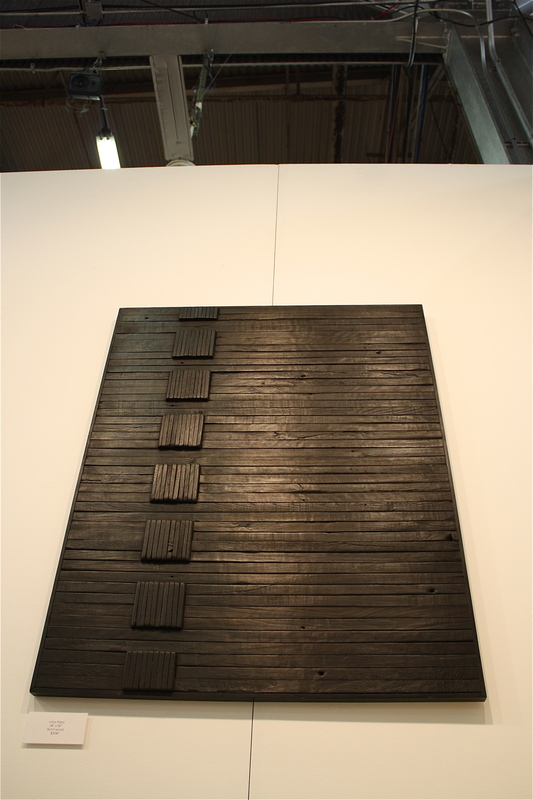 Inspired by the linear repetition of his wood lined chicken coops, he cut and burned old discarded pallets into unique pieces of wall art. 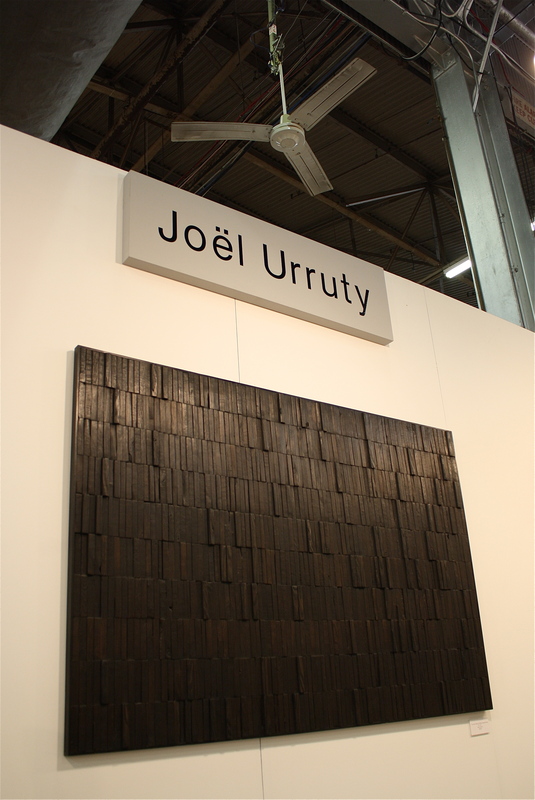 For me, the charred, irregular texture of the wood works harmoniously with the exacting repetition of pattern. How incredible to experience a highly refined work of art knowing it emerged from a forlorn object of storage and transport. Now that’s what I call vision. 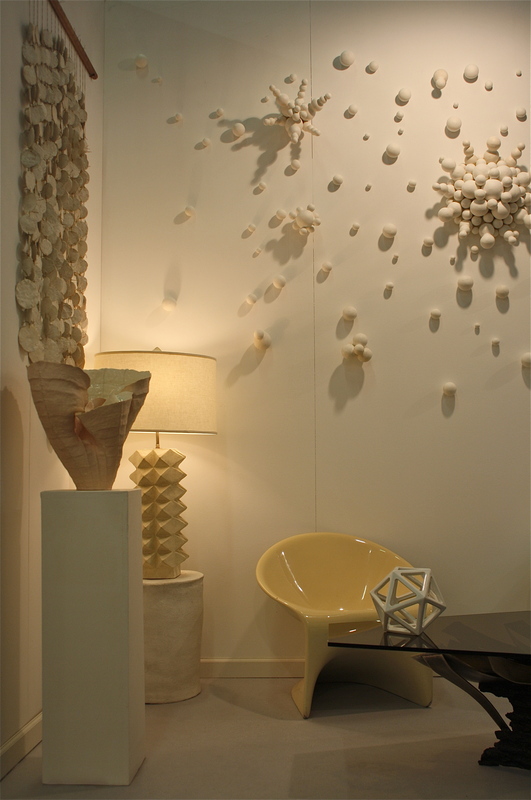 Cocobolo Design ~ I was instantly drawn to this exhibit because of its sophisticated styling and ethereal color palette. Vintage chairs work effortlessly alongside a Katherine Taylor designed coffee table and table lamp by Shizue Imai. 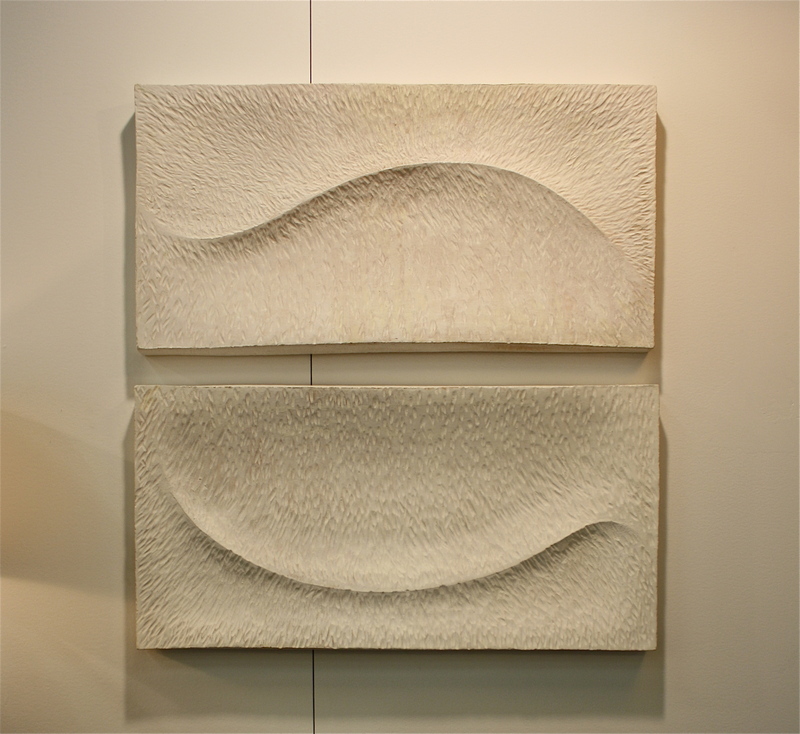 Poetic wall sculptures by Michele Quan and Shizue Imai elevate the eye and invite conversation. 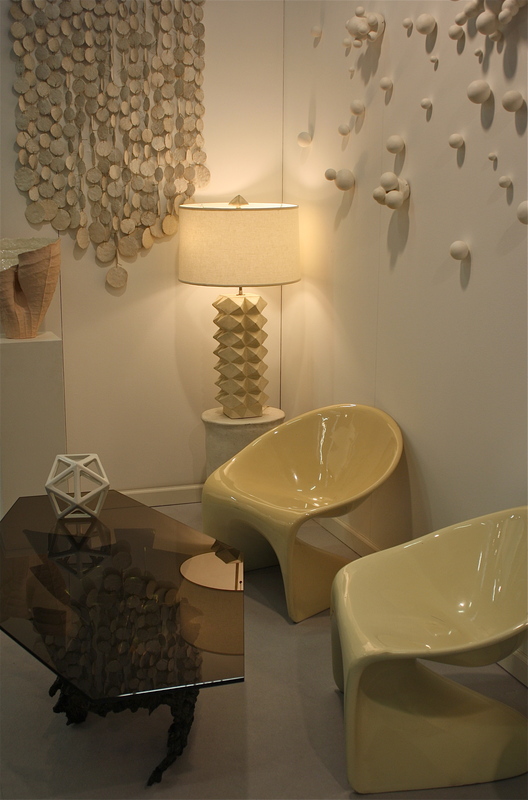 Form, function and beauty unite ~ such is the result of great design. It stimulates our mind and imagination to discover a whole new world of possibilities. 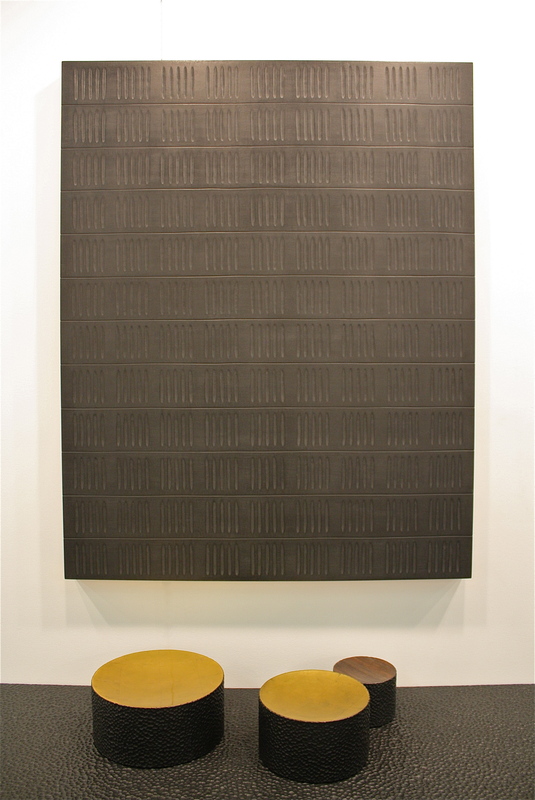 John Eric Byers ~ At first glance, I thought these pieces were crafted from steel but there was an intriguing counterpoint of hard and soft I couldn’t quite figure out. 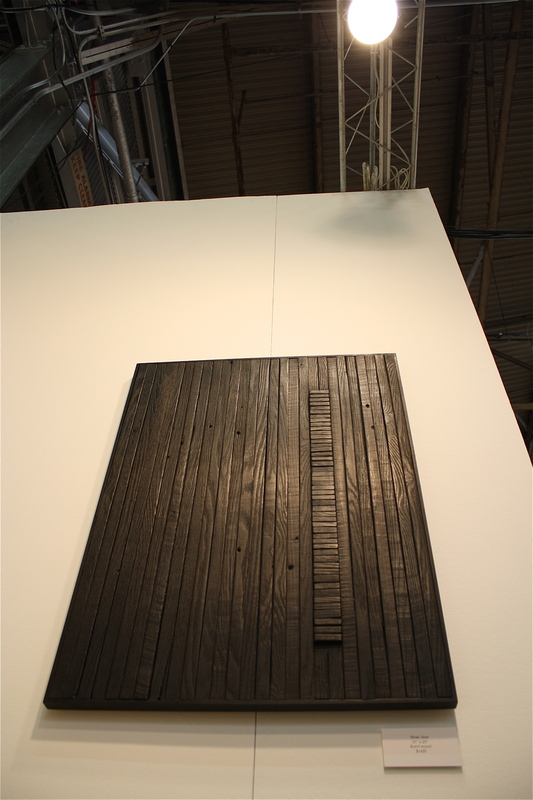 After speaking with the artist himself, I discovered this material to be hand carved blackened hardwood. 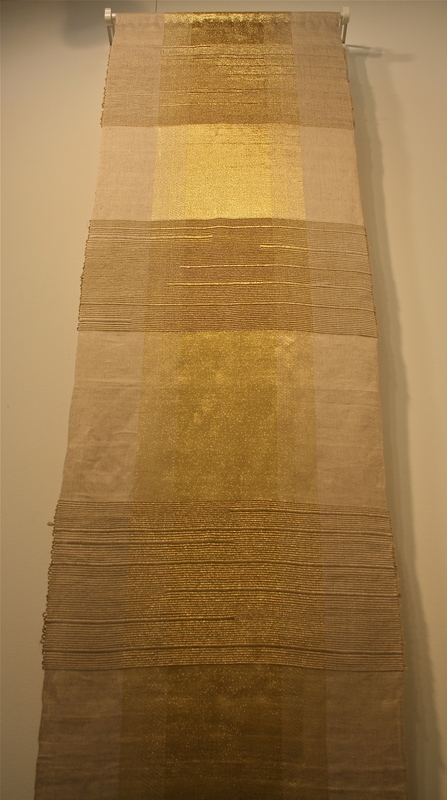 This of course explains the warmth of texture I was feeling, but how unusual and unexpected. 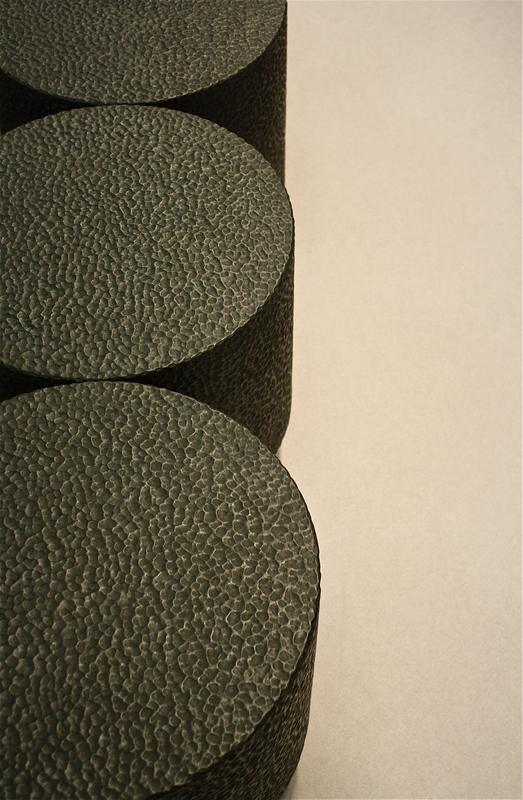 This one of a kind dimpled surface thoughtfully re-invents humble geometric forms, elevating their simplicity into tactile works of art. Isabelle Abramson ~ With todays advanced technologies, artists are finding new and often faster ways to hone their craft. 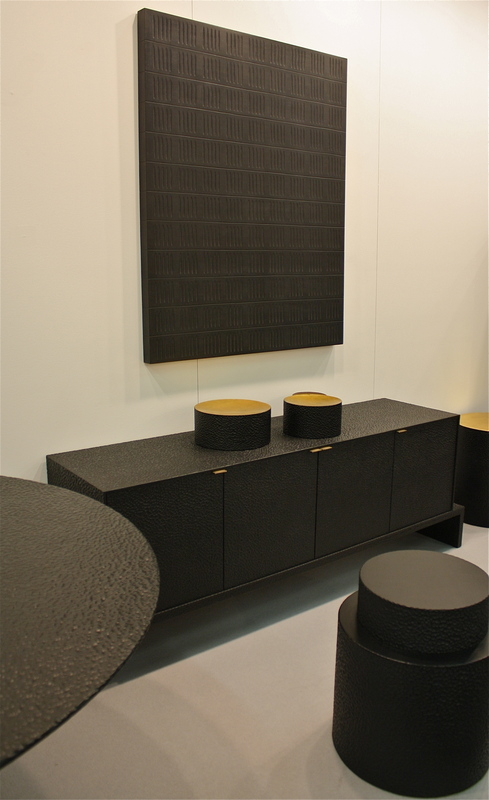 I’m sure we’ve all experienced a textile or piece of furniture using the latest laser technologies and most likely been wowed by the results, but how wonderful to discover artists who still pride themselves on creating hand crafted, one of a kind art. Such is the case with ceramics artist Isabelle Abramson. 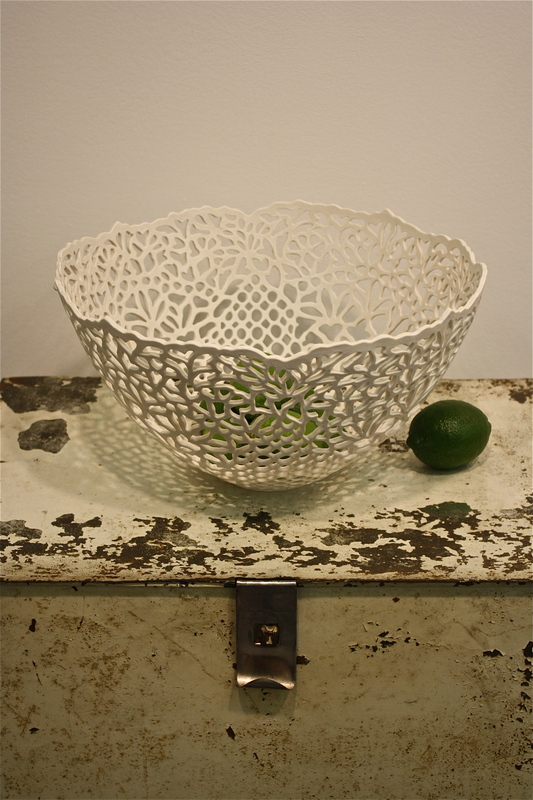 Her meticulously hand carved porcelain bowls and vases celebrate this slow, organic process of creation. Using an all white palette, her lacy negative shapes feel altogether modern and timeless, and her brilliant play of pattern, form and texture leave me wondering what else she is capable of producing. I imagine the possibilities are limitless. 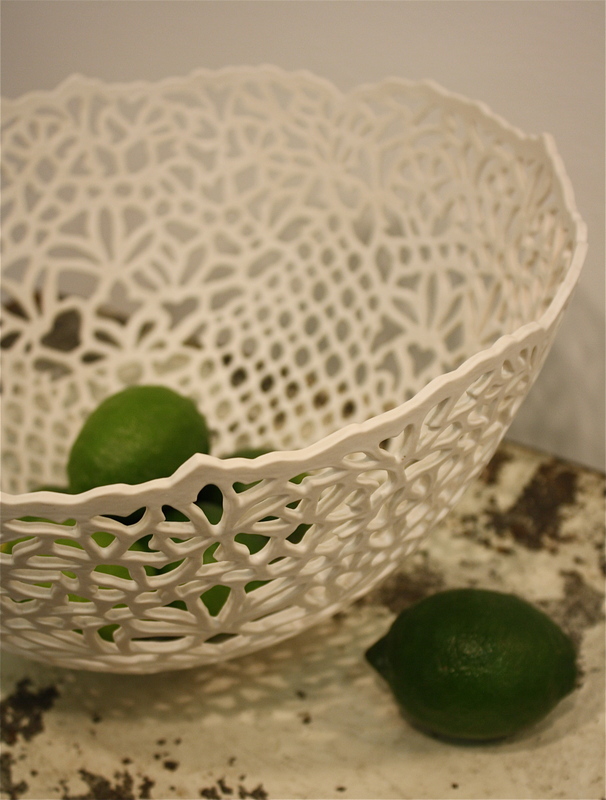 Carved Porcelain Lace Fruit Bowl with intricate lace-inspired design. Glazed with a matte white glaze. 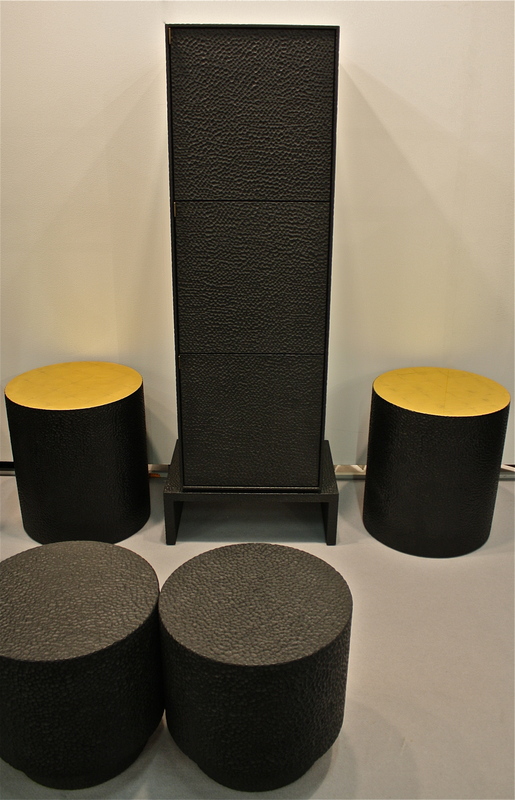 Measures approximately 12.5″ in diameter and 6.75″ in height. 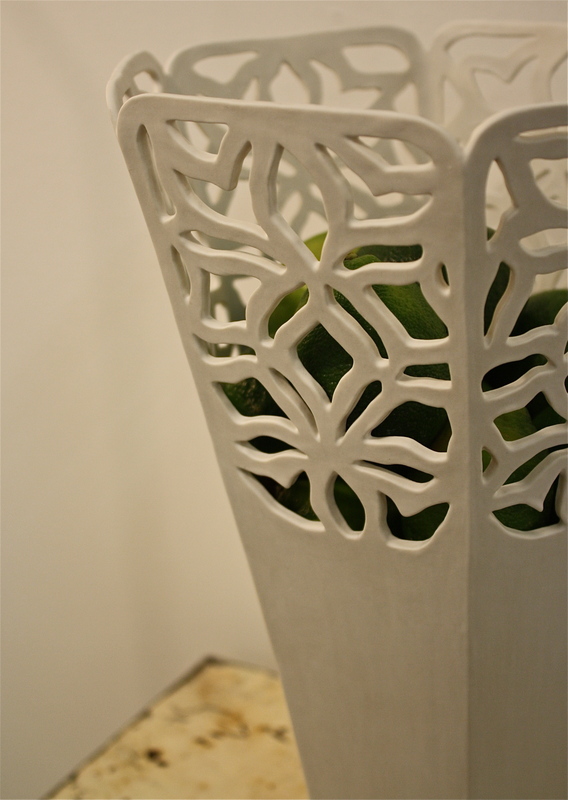 Detail of Porcelain Vase ~ Six-sided, white porcelain vase with hand-carved detail. Measures approximately 13″ in height and 9″ at widest diameter. Glazed with milky white matte glaze. Isabelle Abramson is AMAZING!! I feel so lucky to own one of her bowls! It is my most prized possession. Everything about it is so special. Just lovely. Thank you so much. What beautiful work all done by hand. The golden woven piece just glowed!